Before you start creating your own database and website applications, you will need to sign up to Simbla. Don’t worry it will take you less than a minute. After registration you will be asked to create a website; if you wish to get deep into the online database and web application building, you can simply choose a template or a blank page and get back to your website interface later on. 1. Websites - Your website/UI editor, the place you will create your user&apos;s interface to your website/web applications. 2. Databases - The backend online database system, where you will create and control your data tables, users and permissions. If you already own a website built with Simbla please continue to the next step - "Create your first online database". 1. Templates - choose a readymade template and edit it as you wish. 2. Website wizard - let the website wizard do all the hard work for you. 3. Start with a blank page -recommended only for users with website building experience. 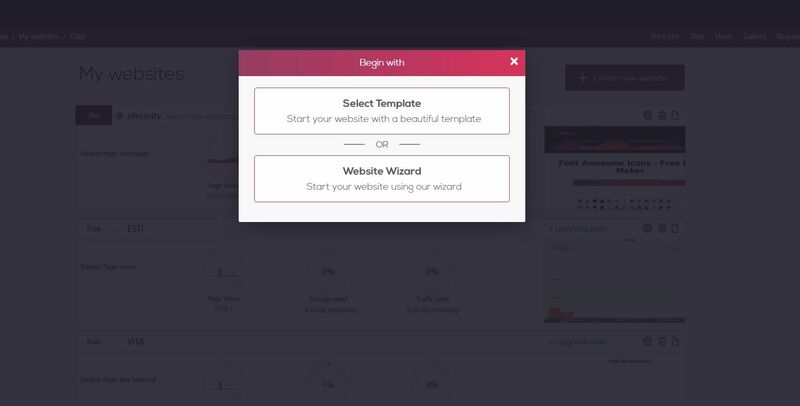 You will find this option in the template library. Click here to view our quick guide on how to create a website with simbla.